If you are in need of Couples Therapy or Marriage counseling services in Oklahoma City, OK contact us today at 405-237-9697. Our Oklahoma City marriage counselors can repair, rebuild, or strengthen relationships. Marriage Solutions offers a unique research centered marriage counseling approach to help couples get better and STAY better long term. When you're looking for couples therapy in Oklahoma City you want to look for help that is proven and reliable. 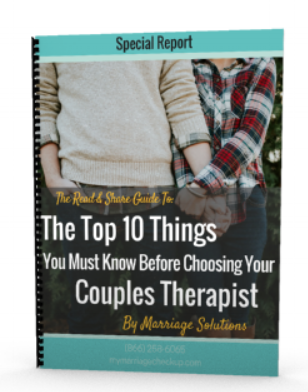 You don't want to trust your relationship with just any therapist because you may only have one shot at getting your spouse to come. You want to make sure that the therapist you trust knows what they are doing and knows how to help couples in your situation. So many therapists generalize and do not specialize. Too many people think that anyone with a degree and license can help them when truthfully that is not the case. You need to take the time to do research and really ask the right questions before you set your first appointment. Luckily, we have created a free online orientation to counseling to help couples like you to make the right decision for you. You can find it here. The online orientation is a 3 video series dedicated to helping you understand your unique situation and decide what to do next. Our master therapists serve the Oklahoma City, Moore, Edmond, & Norman communities. Who can benefit from OKC relationship counseling? Based in Tulsa and Oklahoma City, marriage counseling with our licensed professionals could be described as couples therapy or relationship counseling. Marriage counseling is not only for married people. We help all kinds of couples recognize and resolve conflicts, and improve relationships. You do not need to be married to want to understand your partner better. With Oklahoma City’s finest relationship counseling, you can improve communication and understanding between you and your significant other. Marriage therapy normally involves couples coming together for joint discussions. At Marriage Solutions, however, you can go to marriage counseling by yourself. It can be more challenging to help a couple when only one person is willing to enter counseling, but the goal is the same. Whoever is in our program will have the opportunity to learn about themselves, their behavior, and improved communication techniques. If your partner is threatening to leave you or has already left, you do not need to accept separation or divorce. We can help you heal your relationship, even if your partner is seeing someone else. It is possible to see things from other perspectives. We have the expertise and experience to help you rebuild communication and trust, even if you think that all might be lost. Taking part in marriage counseling does not mean that your relationship is on the rocks. On the contrary, it means that those involved are taking the initiative to strengthen their bonds and understand each other better. It will not take long before you can analyze the positives and negatives of your relationship. This balanced view is critical to understanding each other and working towards a healthier relationship. Our OKC marriage counselors are trained and non-judgmental. They have seen couples who are angry and will not be shocked when people argue or yell. They will act as mediators in these situations, and they will help couples to become aware of their emotions and how to better handle them. Also, your therapist won’t let the session become a fight fest as that is not a productive use of your session. Chatting with friends about relationship problems can be a big help. It can be a good way for people to let off steam. Friends and family can allow individuals to express your fears, frustration, or anger. These people are likely to be biased, though, because of their existing relationships with you. And sometimes expressing emotions to a good listener is helpful, but not enough. To find constructive, practical solutions for both partners, a non-judgmental, professional third party is in an ideal position to hear what is said without bias and to provide strategies and guidance. At Marriage Solutions, we are licensed marriage counselors, licensed by the state (LMFT & LPC). We have helped thousands of couples work through issues that put stress on relationships. Seeking help can be difficult. Once you start seeing your counselor, however, you will benefit from knowing that you are no longer alone. Wherever the counseling journey takes you, you will have the best possible guidance from people who have worked with couples in similar situations to yours. All these issues can put stress on a relationship. Couples often suffer from several issues at once. We have the tools and techniques, as well as a compassionate approach, to help couples through the roughest of times. With the right mindset and some guidance, couples can even come back from infidelity. We can help you return to strength after the discovery of one or more affairs. With Marriage Solutions relationship therapy in Oklahoma City, we can show you a future you might not believe is possible and we will help you reach it, every step of the way. How long does marriage counseling go on? Marriage counseling is flexible. It may last a few sessions to help a couple through a crisis. It may last several months if the couple has deep issues to work through. The length of counseling varies, but most couples start seeing positive results within weeks, if not immediately. The benefits are long-lasting. In fact, 75% fully recover and 85-90% make significant improvement within 15-20 hours. We also know that 90% maintain their improvement even 3 years after they finish with our methods. Contact Marriage Solutions today. We will help you put your relationship back on track. We have the education and experience to assist you in a wide variety of situations. We are not going to take sides. We will not tell you who is wrong and who is right. We will help you to express your point of view constructively, to understand other perspectives, to work together on a solution, and completely heal from the underlying concerns. Complete the online free video orientation or call into our conveniently-located Oklahoma City office to talk about how we can help you heal or develop your relationship. We will estimate how many sessions you might require and how long each one will be. You can expect us to be upfront about fees per session. You do not need to go at it alone. And you do not need to suffer in an unhappy situation. Give Oklahoma City relationship therapy a try. It is easy to begin and you will feel the difference in just a little bit of time. Ignoring problems, or simply not knowing what they are, generally leads to more unhappiness. With couples counseling from OKC’s Marriage Solutions, you can take control of your future.